Present: Lee ZL2AL, Dave ZL2MQ, Mike ZL2MY, Willy ZL2AGD, Wally ZL2MO, Bert ZL2OC, Revell ZL2SS, Peter ZL2CD, Stan ZL2ST, Bob ZL2BDL, Rob ZL2US, Jan ZL2CZE and Karl ZL1TJ. Minutes of the previous meeting were read and confirmed correct: ZL2MO, ZL2ST. Arising: Revell, insisting on a firm time frame for the ongoing club room upgrade but had to be content with statements from both Wally and Laurie that members would prefer a more relaxed approach. Revell’s enthusiasm for getting things done is much appreciated all the same. Finance: Stan reported on financial affairs and reminded the gathering that subs are now due. Rob ZL2US reported the combined branches dinner was enjoyed by all, with some 36 members attending. Lee and Stan kept up the Contest Group’s reputation by clocking up more than 1500 contacts with 70 countries during the previous weekend’s CQ WW CW contest. Conditions were good, the highlight was a contact with EL2DT in Monrovia, Liberia. Wallie sought and was given the ok to source and purchase replacement translucent panelling for the front porch. The timing of further working bees was discussed and agreed on. 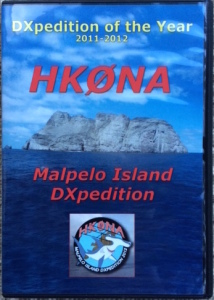 The second video about the December 2011- January 2012 HK0NA Dxpedition to a dismal place called Malpelo Island. A fascinating story. The HK0NA DVD enjoyed by all. Why is it that DXpeditioners choose the most difficult places on the planet to operate from? As Lee says, take part in one of these and you make close friends for life. But it has to be said that it was a miracle that no one was hurt and these guys, some in their seventies must have been both fit and brave. Getting the gear up to the top of the mountain must have been horrendous. Anyway… that’s Ham Radio at it’s best. Thanks Lee for another entertaining presentation.